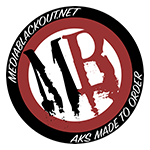 Media Blackout offers a variety of bulk cable. Our four main cable types are Standard Strong, Thin Strong, MegaFlex, and Retractile. Most cables use a Standard Strong cable by default, but some assemblies that use smaller connectors may be configured with Thin Strong by default. The cables we use are proprietary, custom spec'd bulk cable to fit the needs of our clients. We can sometimes offer custom cable types if requested. Please contact us for enquiries. Standard Strong is a flexible, custom-manufactured cable. It has a shielded PVC jacket with a nominal OD of 4.5mm, and is suitable for most applications. For more power hungry applications, we may use a larger neoprene-jacketed cable with a conductor gauge of 18 AWG or 14 AWG and an OD of 5.7mm or 8.6mm, respectively. Thin Strong cable is custom-made to our specifications, is thinner than our Standard Strong cable (2.8mm vs 4.5mm), but is made from the same materials and with the same processes. Thin Strong cable is shielded, and is great for low power devices like monitors, transmitters, and other on-camera accessories. We recommend this cable for constant current draw under 5 amps. MegaFlex cable is a high strand count, silicone-jacketed cable as thin as our Thin Strong cable at 2.8mm, but it is the lightest and most flexible available cable Media Blackout offers. Eliminate cable drag on gimbals, robotic heads, and other specialty applications with MegaFlex. Made in the Greater Los Angeles Area to our specifications. MegaFlex comes in two sizes: 24 AWG and 18 AWG. 24 AWG conductor size is good for constant current pull up to 7 amps. 18 AWG conductor size and a 5.6mm OD cable for high-current applications. Retractile Cable is a coils are lightweight, have a small diameter, and retain their shape even with heavy use. Coils help keep cable clutter down on camera rigs. These are great for keeping short cable runs taught. Made in the Greater Los Angeles Area to our specifications. Our standard coils are 6" retracted, but they can be ordered in custom lengths. Just contact us for a quote.